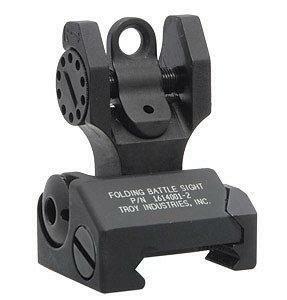 Rear Folding Battle Sight features 0.460" profile when folded. Protected robust adjustment wheel. Dual same plane aperture .50 MOA per click. Aircraft aluminum 6061 & stainless steel. Type III hard coat w/black oxide finish. Weight 1.7 oz. Fixed Rear Battle Sight features provides constant access to fixed sights continuously hold their zero. Extremely durable and reliable providing continuous zero and peace of mind to the operator. Serrated ramp to eliminate glare. Rear Folding Battle Sight Tritium features .0462" profile when folded. Protected robust adjustment wheel. Dual same plane aperture .50 MOA per click. Aircraft aluminum 6061 & stainless steel. Type III hard coat w/black oxide finish. Weight 1.7 oz.